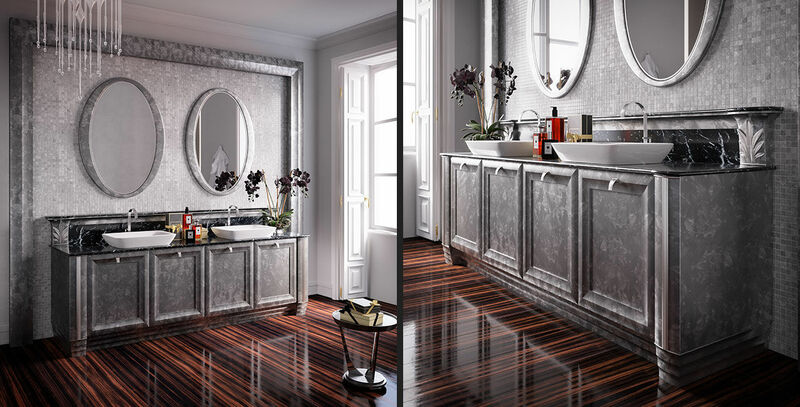 double washbasin cabinet / free-standing / wooden / marble - EGO "OLA"
Ola Line from Ego collection reflects top fashion and elegance and propose linear solution enriched with particular identifiers such us stylised lacquered leaf positioned on both sides of top with splashback. The lateral softly returned lines on bases creates a pleasant game of lines and volume. Wood structure available in many wood essences and finishes. 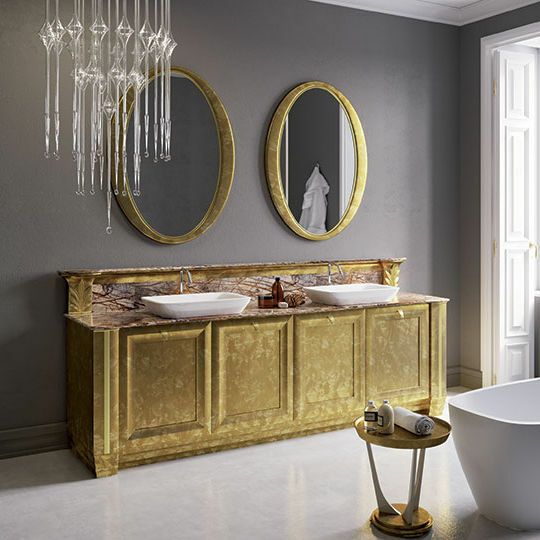 Equipped with large storage compartments presents precious finishes such as marble top, handles with engraved Ego leaf and provide two support washbasins produced in white ceramics. Dimensions: L 270 cm, H 235 cm, D 70 cm, other measures are available. double washbasin cabinet / free-standing / wooden / contemporary OPERA 30 "LUOGO"
free-standing washbasin cabinet / wooden / glass / traditional EGO "CONCEPT"
wall-mounted shelf / contemporary / glass / bathroom EGO "CONCEPT"
double washbasin cabinet / free-standing / wooden / marble EGO "LICIA"
double washbasin cabinet / free-standing / marble / contemporary EGO "CALLA"
contemporary bathroom / marble / wooden / lacquered CONTEMPORANEA "PRESTIGE"
double washbasin cabinet / wall-hung / marble / contemporary CONTEMPORANEA "PRESTIGE"
double washbasin cabinet / free-standing / wooden / contemporary CONTEMPORANEA "ELEGANCE"
traditional bathroom / wooden / glass / lacquered DIAMOND "CLASSIC"